Carlos and Carolyn are a Brazilian/British couple who love sports and care deeply about the environment. They are both teachers with a passion for educating others about the problems of plastic pollution and encouraging people to connect to nature and to live a healthy, active lifestyle. Carlos is a qualified P.E teacher who specialises in working with children with Special Educational Needs (SEN). Born and bred in São Paulo, Brazil he has spent eleven years working in the UK. Carlos is very creative and loves building things from recycled materials. Carolyn is a primary school teacher who set up The Whale Company in 2007 after learning that whales and other marine life were dying from plastic pollution in the ocean. Carolyn is British but was born in South Africa and has lived all over the world; her adventurous spirit and passion for the ocean lead her to become a divemaster and try many water sports, most recently paddleboarding. The Whale Company is an environmental education organisation with a focus on building connections. They complete expeditions and run projects to inspire others to protect nature. 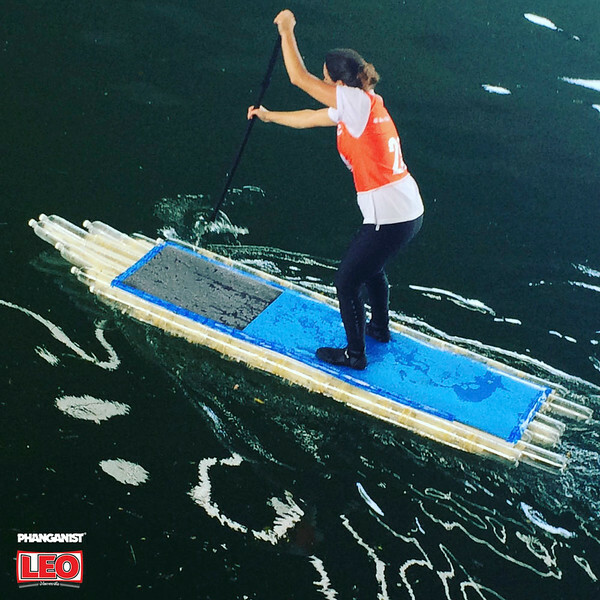 The ‘Bottle Boards’ project is a fun workshop to teach children and communities aged 8 to 80, how to build stand up paddleboards (SUP) out of plastic bottles. To support the projects they sell Whalebags: organic cotton bags; Whaletreads: flip-flops made of recycled tyres and T-shirts. How did Bottle Boards begin? 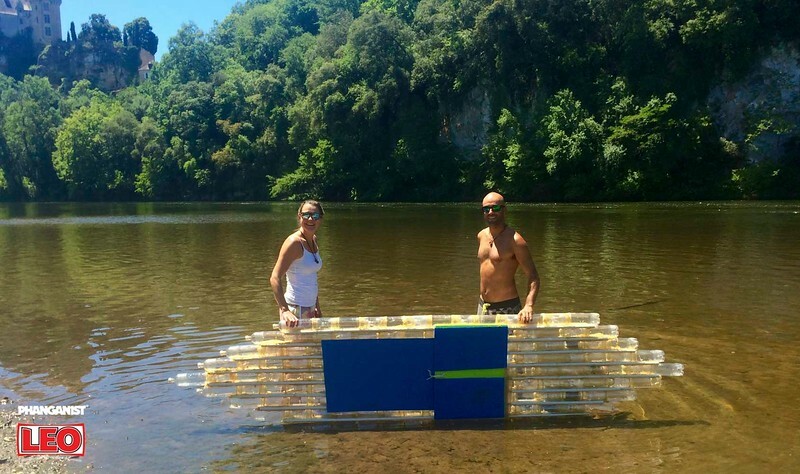 Carlos and Carolyn built their first paddle board out of plastic bottles earlier this year in March in Brazil. 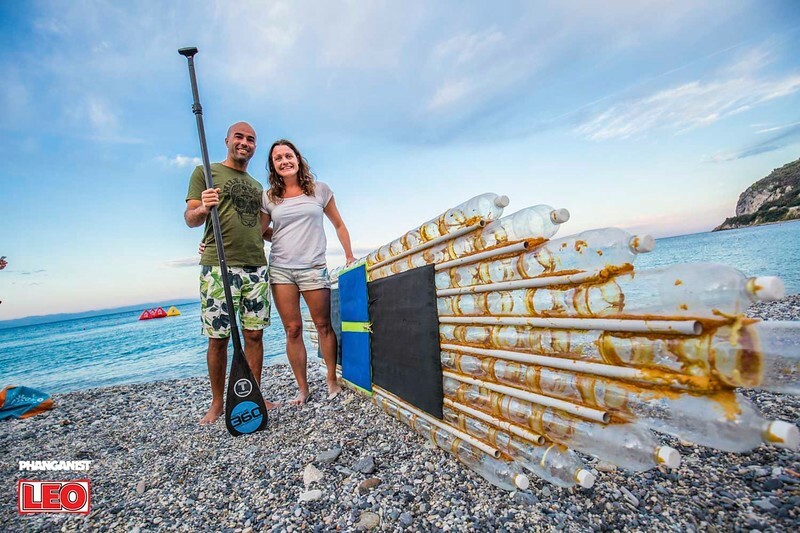 When they took the ‘Bottle Board’ to the beach, they could not believe the attention it received and they realised that it was an incredible tool to initiate a conversation about plastic pollution in the ocean. They came up with the idea to paddle 12 marathons in 12 countries in Europe to raise awareness. Did you come up with the design yourself? No, the board was invented ten years ago by Brazilian surfer, Jairo Lumertz. He now runs a fantastic education program in Brazil teaching the importance of protecting the environment though his ‘Eco Boards’. Sandpaper the bottles and sleeves. Connect the pipes to make a board. Where have you travelled to with this project? It all began in Brazil; then over the summer we paddled 12 marathons in 12 countries in Europe. We started on World Oceans Day on 8th June in France, then Spain, Portugal, Italy, Slovenia, Croatia, Greece, Macedonia, Bulgaria, Serbia, Bosnia and Montenegro. We are now in Thailand and in the next 2 months we will be going to Bali, Lombok and Myanmar. What kinds of issues does it help with? Plastic is an excellent material – it is strong and versatile and can be used for virtually anything. The problem is that it lasts forever. It does not biodegrade and it simply does not go away! Although it can be recycled, in reality most of it is not and the problem is that we use this indestructible material for single-use throwaway items – which is madness! We need to change the way we use plastic urgently and we need to think of innovative ways to RE -use what exists already. SUP is a great sport but the boards are expensive and made of environmentally unfriendly materials. Our Bottle Boards use waste plastic bottles and turn them into a resource. 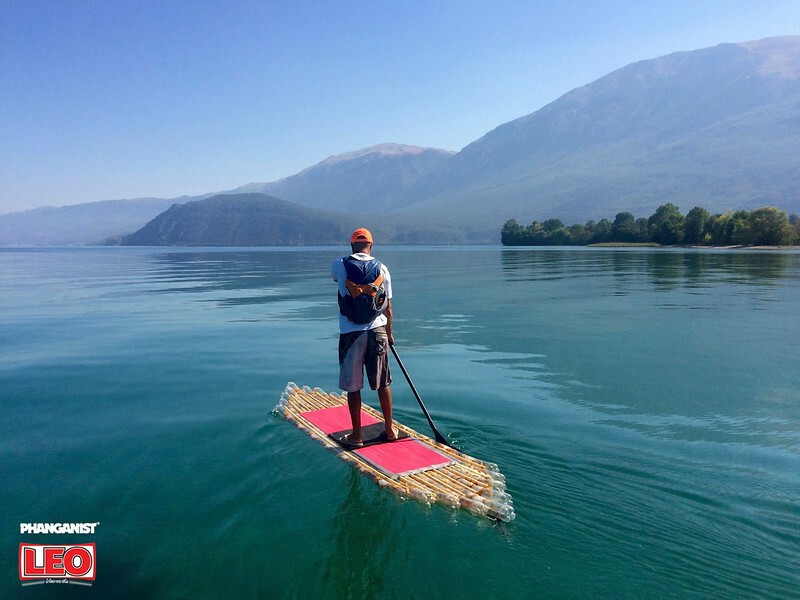 It is cheap and a good way to introduce people to SUP who would otherwise be unable to afford it. When you see the board, it creates a real impact. There is a mix of disbelief that it works and awe. We want to encourage children to think creatively. We do not recycle all the plastic that exists and as it persists in the environment for thousands of years, we need to develop new ways to use it. We want to help children to become innovative, environmentally conscious designers. In flood zones Bottle Boards will make good emergency rafts. People can set up SUP clubs to allow locals to enjoy the water. Carolyn came to Koh Phangan 12 years ago and loved it; she is very interested to see how it has changed since then. Carlos is looking forward to visiting the island. What will you do whilst here? Carlos and Carolyn would like to explore the island, go paddling (and perhaps even diving) and they will be building a board at Si Ri Panya School in Ban Tai on Tuesday. 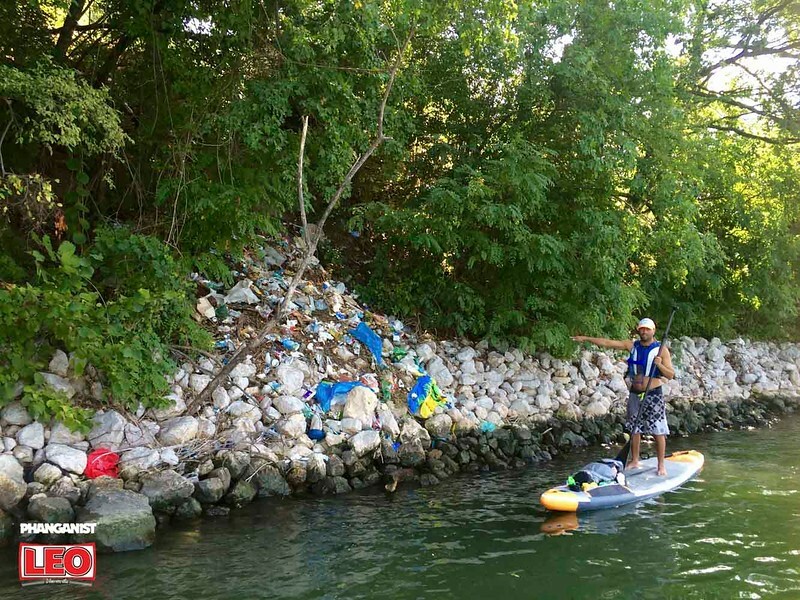 If possible we will join Trash Hero for a clean up. How does this help the local Thai people? It is a way to change how people think about waste in a positive way. The bottles can be viewed as a valuable resource. What are the long term goals for bottle boards? We want to encourage more people to connect to nature – so that they protect it because we protect what we love. And what are the main environmental issues you are seeing/addressing right now? Plastic pollution in the ocean; flooding. We believe that we are all connected, no matter where in the world you come from. Through connecting with nature we connect to ourselves and this then enables us to connect to others. Through BOTTLE BOARDS we want to help people to connect to nature, to themselves and to others. When you do a physical activity you become present; you forget the stresses of life and feel happy in the moment. We live in a society surrounded by noise and distraction, many of us are addicted to technology, isolating ourselves from the real world and as a result depression and obesity are on the rise. We want to encourage you to take time out and find some space for yourself. Paddling is a great exercise which raises the endorphins in your body and makes you feel good! We bring communities together to build boards. Doing an activity in a group teaches patience, communication and teamwork. And while you are having fun, communicating and building connections you are also learning a skill for life – how to turn a waste material into a useful resource. We need to encourage a new generation of innovators and environmentally conscious designers to lead us into a better world. For information go to the website. What's the best cure against a bad hangover? Fresh air! Plastic Things You Can Stop Using Right Now on Koh Phangan!